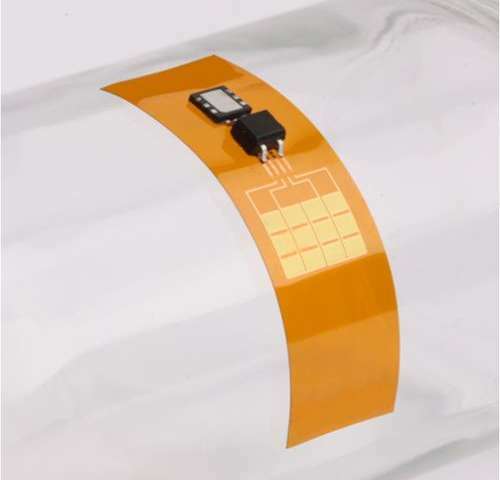 Thin, flexible mechanical energy harvester, with rectifier and microbattery, mounted on a curved glass support. Credit: University of Illinois and University of Arizona. Currently, when the battery inside a device such as a pacemaker runs out of power, patients must undergo surgery to have it replaced. Several devices that take advantage of the body's natural parts have been devised to allow for the creation of electricity internally so that implantable devices can run for a lifetime, preventing the need for additional surgery. Most such devices have been too small to actually charge a real device, however, as they are very much still in the research stage. In this new effort, the research team takes the idea further by creating miniature power plants that are large enough to power real implantable devices. The new device has nanoribbons that are made of lead zirconate titanate—they are covered by flexible, biocompatible plastic, as are the other two main parts: an integrated rectifier and a rechargeable battery. 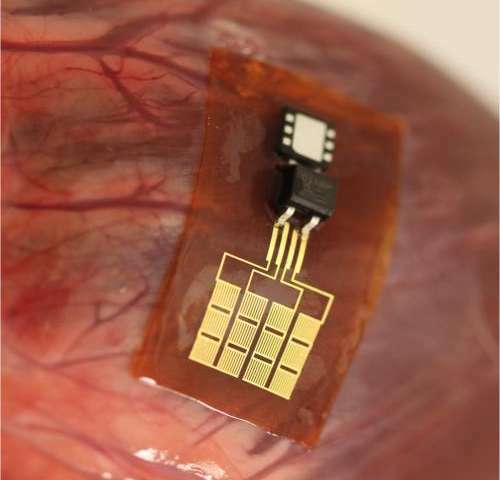 The device is sewn directly onto the heart, lung or diaphragm—all parts that are in constant motion—as the body parts move, they cause the ribbons to bend slightly, which in turn causes the creation of a small amount of electricity. 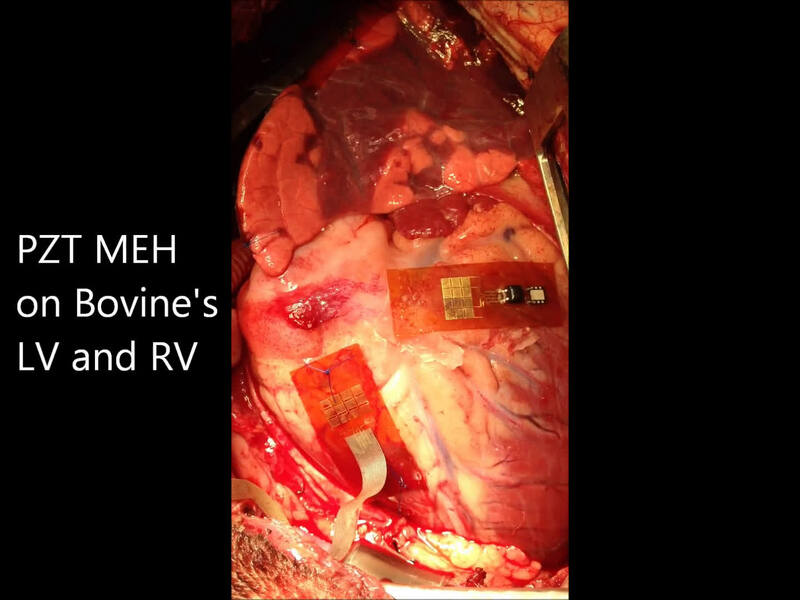 Thus far, the devices have been tested on cows and other large animals—the team reports that they are able to create enough electricity to power a pacemaker or other implantable device indefinitely. The devices aren't ready for clinical trials just yet, of course, there is still the issue of figuring out if suturing devices onto important organs causes damage. Also, long term testing will need to be done to ensure that the devices are able to survive inside the body for as long as would be needed, and a replacement for lead will likely have to be found as placing a toxic substance inside a device so close to a vital organ would seem incongruous. Thin, flexible mechanical energy harvester, with rectifier and microbattery, mounted on the bovine heart. Credit: University of Illinois and University of Arizona. This is pretty cool. Think of all the diabetics that could get implantable insulin pumps which simply have a self sealing opening for occasional insulin recharge. Or just your basic implanteable biomonitor for people with brady/tachycardic events that occasionaly sends an update to a medical center.